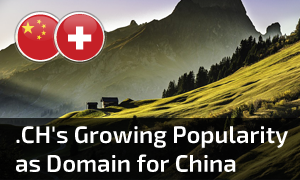 The country code domain for Switzerland, .CH, may soon get a new "identity" as a domain correlated with China. The .CH extension, made available in 1987, is the national domain of Switzerland, and it has been operational for almost as long as the legacy domain .COM which is just two years older. Over the years, .CH has gained its reputation on the domain market as a stable and “mature” domain, with growing popularity among registrants and investors globally. But could there be another reason why the Swiss suffix has been attracting a lot of attention among entities outside Switzerland and other German-speaking countries? Apparently, yes. Within the context of global trends on the domain market and the potentiality of mental connections, it has been observed that the .CH domain may stand for more that just the Swiss country code. In fact, for many domain enthusiasts, particularly not associated with the domain industry, .CH also carries a correlation with China. China has had significant influence on forming new trends in the domain industry. Chinese capital sustains the secondary market to a great extent, and it has also affected the development of new domains program. The purchasing potential of Chinese Internet users has also contributed to the rising prices of both the old generic extensions and new gTLDs. Another reason why the Swiss domain may be interesting to investors is the increasing popularity of short domain names, particularly numeric domains as well as those using “exotic” letters, such as “q” or “x”. From that perspective, investing in a name with a short extension, like .CH, may seem like a reasonable thing to do. And, although .CH stands for Confoederatio Helvetica – the Latin name of Switzerland, to a majority of domain registrants from outside the industry the acronym has a connotation with China. Furthermore, .CH seems attractive as a domain intended for the Chinese market because there are a lot of valuable keywords still available for registration. Recent data posted by the registry of the Swiss domain show that there are about 2 million names registered within the .CH. With four official languages in Switzerland (French, German, Italian, and Romansh), the most names registered under .CH are in German, which points to a conclusion that a large number of names in English are still attainable. And, while most meaningful keywords for the European market may have already been reserved, there are plenty of combinations still available for customers in China. Those would include numeric domains, and names made up of letters which may often be a Latin transcription of Chinese keywords. It may also be worth noting that the .CH domains on the secondary market sell at considerably high prices. The typical transaction amounts involving .CH domains fluctuate around four-figures. Additionally, registration and maintenance costs are also relatively low for Swiss domains in comparison to numerous other country code extensions, particularly, looking from the perspective of the potential return on a smart investment. If you are interested in extending your reach to the Swiss and/or Chinese market online, the .CH extension may be right for you. Feel free to use our search tool to check if you desired names are available, and register you selection online. Should you have any questions, contact our friendly support team at support@europeid.com.